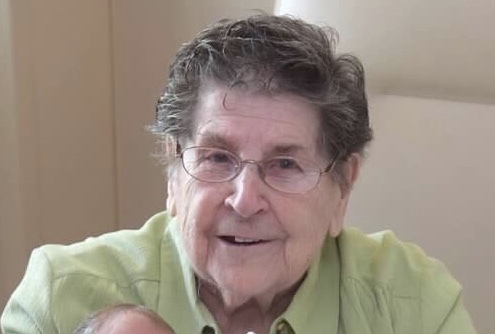 Martha Elizabeth McCart, a homemaker, age 100 of Toronto, OH passed away Monday April 1, 2019 at her home surrounded by her loving family. She was born July 22, 1918 in Steubenville, OH the daughter of the late Thomas and Mary (Eddy) Young. Martha was a 1936 graduate of Toronto High School. She loved to do crafting, ceramics and crocheting. Besides her parents, she was preceded in death by her husband, John Wright McCart in 1980; brothers, William and George Young and a sister Molly Lee. Martha is survived by her daughters, Rhonda Fleming and Neysa McCart both of Toronto, OH; sons, John (Tammy) McCart of Toronto, OH and Kevin (Trudy) McCart of Steubenville, OH; grandchildren, John William McCart, Erin (Charles) Mader, Lacey Fleming and Courtney Fleming; great-grandchildren, Garen and Grayson Mader. Martha was greatly loved by her nieces and nephews and anyone who knew her. Visitation hours for Martha will be held 4-8 Friday, April 5th at the Clarke Funeral Home, 302 Main St., Toronto, OH. A celebration service of Martha’s life will be held 11 A.M. Saturday, April 6th at the funeral home with Reverend Steve Smith officiating. Interment will follow at the Ft. Steuben Burial Estates, Wintersville, OH. Memorial contributions in memory of Martha may be made to the Toronto High School Alumni Association.